For Poles and Polish Americans, education is of the utmost importance. As Polonia expanded down Sycamore many parents living beyond Lathrop were afraid to send their children to the distant schools at Transfiguration and St. John Kanty’s. In June 19, 1908, Wladyslaw Zawadzki , Joseph Urbanski, Francis Smigala, Constantine Wroblewski, Andrew Tomaszewski, and 60 supporting families received permission to start a new church and school. To establish the parish the bishop assigned Father Leopold Stein to takes the reins of the project. The first building that was home to St. Luke’s school was a storefront on land Father Stein purchased. A small wooden church was quickly built while a more permanent brick structure was started. The brick combination church and school building designed by architect and parish founder Wladyslaw Zawadzki took less than five months to build and was already being used by the winter of 1908. Father Stein left St. Luke’s in 1913 and was replaced by Reverend Stanislaus Fimowicz. The much younger priest walked in on a fast growing church, a crowded school and sisters in need of a convent. Fimowicz quickly figured out that the combination building would not meet the needs of the parish in a few years. A home was purchased for the sisters and the land around St. Luke’s was slowly acquired. By 1925, the strain of overcrowding was being felt and planning for a new church began. 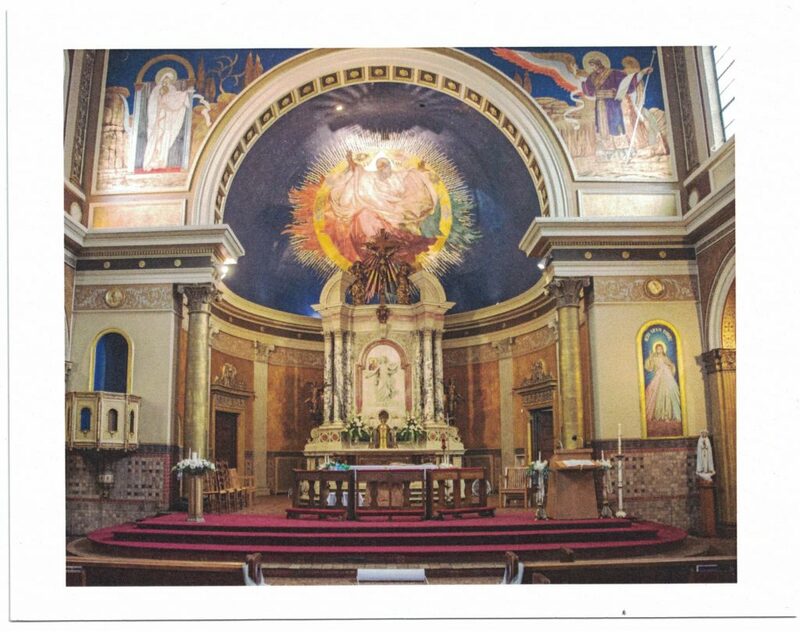 For his new church, Father Fimowicz chose the architectural firm of Chester Oakley & Albert J. Schallmo which had proven their talents with Blessed Trinity and St. John the Baptist. When planning began for the new church, Oakley and Schallmo first met with Zawadzki to gain his insight in to the area and Polish community. To further appeal to Polonia, Oakley and Schallmo promoted their staff architect Joseph E. Fronczak to project supervisor. The design that the team came up with for St. Luke’s was inspired by the Church of St. Paul Outside the Walls in Rome, Italy. 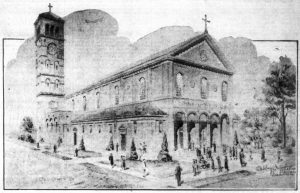 Ground was broken for the Roman basilica-style church on October 30, 1927, with Father Fimowicz turning over the first shovel of soil. By June 3, 1928, the foundation of the church had been completed and Father Stanislaus Fimowicz was seeing his hard work come to fruition as the painted terracotta frieze was installed. The finished church was dedicated May 25, 1930. Like many of the Polish parishes in Buffalo, St. Luke’s prospered throughout most of the middle half of the twentieth century, but things began to change in the 1960s. Families slowly started to trickle out into the suburbs and by the 1980s they were leaving in droves. In 1985, the parish closed the school because of low attendance and for the next eight years St. Luke’s fought to stay alive. The end came for the parish in 1993 when the Diocese of Buffalo finally closed the church. For most churches that would be the end, but St. Luke’s was resurrected when Amy Betros and Norm Paolini purchased the campus shortly after the church closed. The pair created Saint Luke’s Mission of Mercy, “a donation driven non-profit that meets corporal and spiritual needs of their community members in a Roman Catholic tradition.” The mission has been going strong since 1994 and like their predecessors a century earlier, a successful school is one of their crowning achievements. 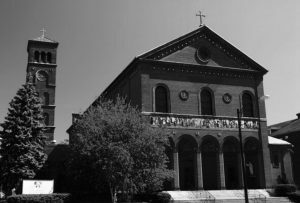 “Buffalo, NY - Church: St. Luke's." The American Contractor [Chicago - New York] 18 Feb. 1922: 52. Print. "Corner-Stone of St. Luke's Church to Be Laid Today." Buffalo Courier[Buffalo, NY] 20 Sept. 1908: 27. Print. St. Luke's Parish, Buffalo, N.Y.: Diamond Jubilee, 1908-1983. [Buffalo, N.Y.]: S.n., 1983. Print. "St. Luke's Parish to Mark Anniversary of Founding." [Buffalo, NY] June 1933: n. pag. Print.